Posted on Sun, Jan 29, 2012 : 6 a.m. If you were looking for the "Happy Networking Group," they meet down the hall. 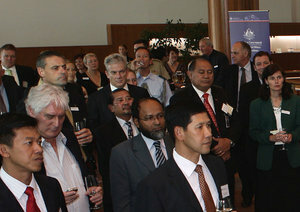 Photo by Flickr user "Asia Pacific Civil-Military Centre of Excellence"
We've talked quite often about joining and participating in networking groups. The events that these organizations put on can be a font of new contacts whom you can develop into strong networking partners. So why would you ever quit? Actually, there can be any number of reasons. Even if you've done your homework and made sure that the type of group, its members and the kind and number of events meet your needs, there are still times when it might make sense for you to part ways. All of these reasons, though, presume that you have already put forth your best effort to participate. Culture. For whatever reason, what felt like a good fit at first turns out just not to be the case. That can happen, and there is no shame in recognizing it. This doesn't make you or the existing members wrong, just not right for each other. You'll probably discover this within the first few months or so. Goal accomplished. You may have joined the group in order to achieve a particular task. Maybe you became part of a board in order to help transition the organization through a particularly hard time. When you've completed that goal, though, it will be time to re-examine whether you still need to be a part of the group. Mission impossible. Part of your analysis of a group should have included whether it has the potential to meet your needs. Meeting clients, social interaction, collaborating with colleagues, etc. — whatever those needs might be, you may realize later that it just isn't going to happen. If that's the case then you have to stop wasting your time (and that of the other members of the group) and move on. One caveat with this one, though: Be sure you have given the group enough time. If the need you are trying to fulfill is to get more clients, it may take three to six months (or even longer) before your networking activity will pay off. Group change. Maybe a new leader comes in and makes some changes. Maybe the organization has run into some financial challenges which force it to cut back on some of its programs. Maybe one of the pillars of the community moves to a different state. For whatever reason, the group is no longer what it was when you first joined. At that time, you need to take a hard look at your participation to see whether the group still meets your needs. You change. This is especially the case when you join an organization in order to connect with a particular industry or social sector. Perhaps they are your target market. Maybe they are your colleagues. If your needs have changed (you are focusing on marketing firms instead of nonprofits, for example), then your associations will likely change, too. Quitting a group for the right reasons can make way for more profitable and enjoyable associations in the future. Be sure, though, that it is for the right reasons. If you haven't put forth the effort to become a valued part of the group, if it's your own impatience which is making you bolt, if you are just bored and looking for something new to do — you will likely never be satisfied with any group. Really, at the bottom of it all, if you and the organization are both benefiting from the association, then you should stick around to see what develops. Huh, that sounds kind of like what you're supposed to be doing with the people you meet. Imagine that.